As the eight-season journey on Game of Thrones soon comes to an end, fans are certainly curious about where we will see our favorite stars next on the big screen. Jason Momoa certainly made waves as Aquaman after portraying Khal Drogo, and Sophie Turner is playing the titular role in the next installment of the X-Men franchise, Dark Phoenix. What about fan-favorites Daenerys Targaryen and Jon Snow, a.k.a. Emilia Clarke and Kit Harington? Their characters are connected in more way than one! The two actors have notably had some bad luck with their big budget action movie endeavors, and here Emilia Clarke admits to regretting them. 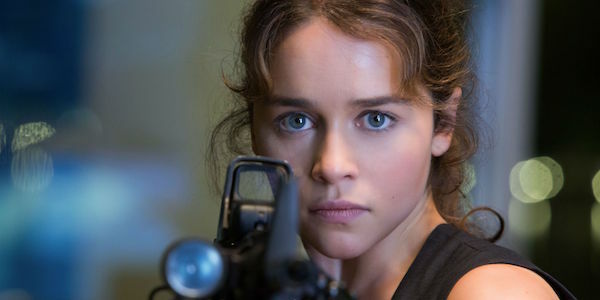 Of course, Clarke notably played Sarah Connor in the 2015 failed reboot Terminator: Genisys, which in the past she has said she was “relieved” to see fail at the box office so she wouldn’t have to return for a sequel because “no one had a good time” making it. Clarke also recently played Qi’ra in Solo: A Star Wars Story, which was deemed the biggest disappointment for the franchise – though obviously nobody is placing any blame on the actress. The movie dealt with some problems during production, such as the replacement of Phil Lord and Chris Miller with Ron Howard in the midst of filming. On Kit Harington’s end, the actor starred in 2014’s period volcano thriller Pompeii, which only made $117 million worldwide with a $100 million budget, and Seventh Son, which has comparative disappointing numbers with a $114 million worldwide take against a $95 million budget. These are reasons enough for the Game of Thrones stars to be apprehensive about starring in action movies, but luckily they had each other to talk out shared experiences, even though they were on completely different projects. Looking ahead, Emilia Clarke is starring in a rom-com with Crazy Rich Asians’ Henry Golding called Last Christmas, and in a crime-thriller titled Above Suspicion – neither of which are being made as tent-pole blockbusters. Kit Harington will next be seen on the big screen starring in the drama The Death and Life of John F. Donovan, which premiered last year at the Toronto International Film Festival and isn’t currently set up with a domestic release date or distributor. The actors will be the talk of the world when the premiere of Game of Thrones‘ six-episode final season premieres on April 14th, leading to an ending for their characters that Clarke said “fucked [her] up” and got Harington crying at a table read.